Now I will work on the clouds! I used a very clean, wet, number six round brush with very soft bristles. Making a small circular motion, I lifted and softened the edges with a very light touch. I used a paper towel to gently lift the wetted area. I used the same technique, only with more pressure, to lift the whiter, lighter areas of the clouds. When working on this section, note that clouds have a light and dark side, especially if they are somewhat thick and billowy. The edges should be rounded, soft and irregular. Let the painting lead you. Don't overwork this stage, just stand back and see where you think the cloud should be lighter, here and there. If you have clouds in the sky today, take a close look at them. Notice where the lights and shadows are. Notice how the shapes look. Clouds are very forgiving and fun to paint because you can make them up as you go. When this is dry, mix a tiny bit of French Ultramarine Blue and Burnt Sienna in wash that is about 90 percent water and 10 percent (or less) pigment. With your number six round brush, apply a tiny bit of this mixture to shadow areas of the cloud and immediately clean your brush and soften the edges of the wash with a damp, not wet, brush. Be careful not to apply shadows that are too dark or too uniform. Clouds don't really have sharp edges, so to make yours believable, you have to have subtle edges, shapes and values. Hold it up in a mirror to see it with a fresh eye. If you have overworked any areas you can do some softening and lifting. 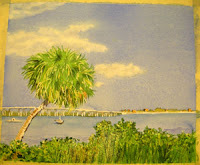 During my evaluation of this painting, I felt that I had over worked the foreground, which took away from what I wanted to be my focal point (the boats and palm tree). I mixed a very wet, pale wash of Sap Green and Burnt Sienna and washed it over the foreground, making sure I used very little pressure on my brush and not stroking the area more than once. I used a number 16 round brush to keep from over working and blending too much. I liked the softening effect this had on the area. 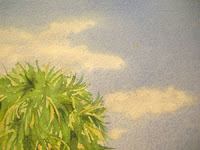 I still had some texture and value changes, but it was less focused and thus brought the eye back to the palm tree.